Intel on Tuesday unveiled its latest laptop processors based on the Coffee Lake platform, most notably bringing its high-performance Core i9 line to laptops for the first time in the same thermal profile that the existing 15-inch MacBook Pro design can accommodate —but the new chips still don't support LPDDR4 RAM. 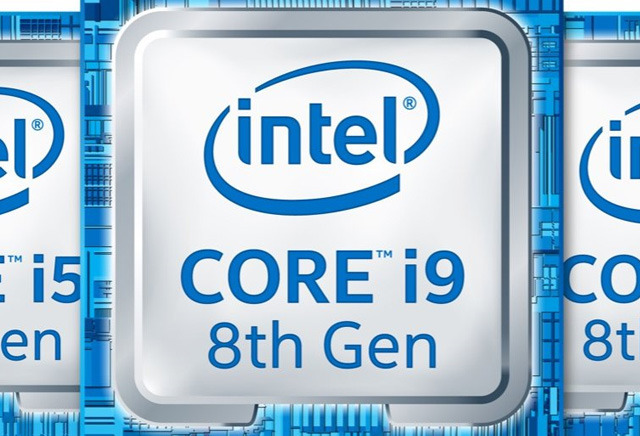 The Core i9-8950HK is a six-core chip with a base clock speed of 2.9 gigahertz, and Turbo Boost speeds up to 4.8 gigahertz on a single core, Intel said. It nevertheless has the same 45-watt thermal design power as the quad-core, 2.8-gigahertz Core i7 in the entry-level 15-inch MacBook Pro. While likely vastly more powerful and expensive than the average person needs, Apple could theoretically adopt the chip as a customization option for Pro buyers who run extremely demanding apps such as Final Cut Pro X. In December Apple updated the video editing suite with 8K video support, and the extension of 360-degree VR video to Motion and Compressor. Those buyers could also take advantage of macOS 10.13.4's external GPU support to provide performance closer to the level of an iMac Pro with the flexibility afforded by a laptop. 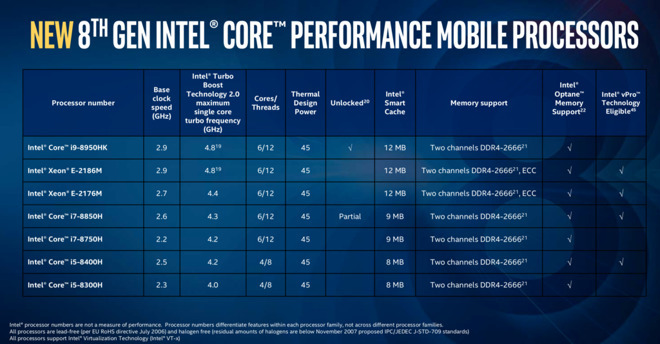 Intel has also refreshed its mobile Core i3, Core i5, and i7 lines, including two six-core i7 chips clocked at 2.2 and 2.6 gigahertz, and a quad-core one rated at 2.7. 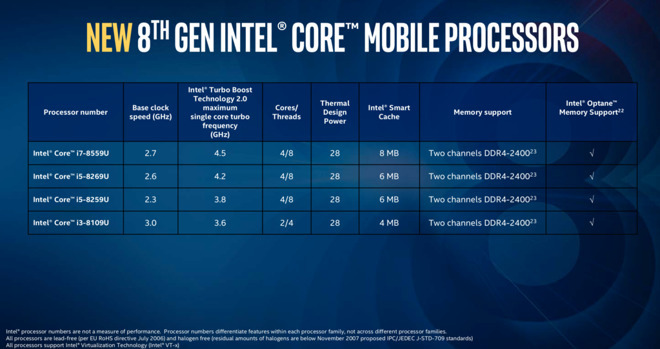 The new i5 chips are quad-core models coming in at 2.3 and 2.5 gigahertz, though there are actually two processors at the 2.3-gigahertz level: one with a 3.8-gigahertz Turbo Boost, a 6-megabyte Smart Cache, and 28-watt TDP, and a second with a 4-gigahertz boost, an 8-megabyte cache, and 45-watt TDP. The current 13-inch MacBook Pro has a 28-watt TDP. The processors do not support LPDDR4 memory, sticking with the same LPDDR3 as found in the 2016 and 2017 MacBook Pro limiting RAM to 16GB. As a result, should Apple choose to bring 32GB of RAM to any new MacBook Pro, it would have to use DDR4 RAM, and implement a controller for it with both having large impacts on battery life. Rumors have yet to gather steam for this year's MacBook Pro updates. Apple is reportedly planning to switch to its own custom Mac processors as soon as 2020, though, which for some people could make 2018 models the last they get before Apple transitions away from Intel.